Landpower Solar Panel Tile Roof Mounting System is engineered for the maximum flexibility possible in designing and planning for various tile roof solar system installation. It is applicable to install the usual module to flush with the pitched roof. Using our innovative Rail and pre-assembled components like tilt-in T module, clamp kit and various hooks our Tile Roof Mounting makes the installation easy and quick to save your labor cost and time. Note: The component is not limited as above, we carry high range of tile roof racking component for various tile roof,if you can't find components above,please feel free to contact us for more details. The grounding systems include components like earthing lug, earthing clip and bonding jumper etc which makes the solar array more safe. The tilt-in T module can be put into the extruded rail from the any location and can be highly pre-assembled with the clamp and roof hook to guarantee a fast and easy installation process. The high range of engineered roof hooks and other holding devices ensure the mounting structure fit diverse roof tile and load situations. Both crystalline module and thin film module can easily be installed on most kind of tile roofs in landscape or portrait. Landpower Solar Panel Metal Roof Solar Mounting System is engineered for the maximum flexibility possible in designing and planning for various Corrugated,Trapezoidal metal/pvc roof solar system installation. It is applicable to install the usual module to flush with the pitched roof. Using our innovative Rail and pre-assembled components like tilt-in T module, clamp kit and various holding devices (like hanger bolt and L bracket etc.) our Metal Roof Mounting makes the installation easy and quick to save your labor cost and time. Note: The component is not limited as above, we carry high range of various Corrugated,Trapezoidal metal/pvc roof racking component for various metal roof,if you can't find components above,please feel free to contact us for more details. Landpower design and produce various roof clamp and fixings for various Corrugated,Trapezoidal metal/pvc roof, if you have specific metal/pvc roof shape, feel free to contact us, we are here to make customized solutions for you. The high range of engineered holding devices ensure the mounting structure accommodate most of trapezoidal sheet metal roofs. Both crystalline module and thin film module can easily be installed on most kind of metal roofs in landscape or portrait. Project Reference(click here): Landpower PVC Corrugated Roof MW Project. Angle Adjustable Tilt Solar Racking System is specially designed for easy installation of solar panel to tilt a certain angle with the roof. The mounting system design provides a strong and sturdy support for solar modules, it can be a fixed angle or adjustable such as 10~15 degree, 15~30 degree and 30~60 degree for your requirement. 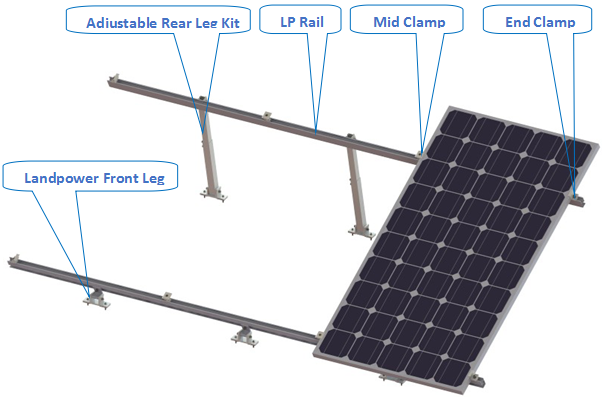 Using our innovative Rail and pre-assembled components like tilt-in T module, clamp kit and highly pre-assembled tilt leg, This Metal Adjustable Tilt Solar Mounting makes the installation easy and quick to save your labor cost and time. Please click Landpower Adjustable Tilt Solar Mounting for concrete project for your reference!!! Landpower Shingle Roof Solar Mounting System is especially engineered for asphalt shingle roof. It highlight the component of universal PV Roof Flashing which is water tight and durable and compatible for most of roof racking. Using our innovative Rail and pre-assembled components like tilt-in T module, clamp kit and PV mount flashing, our Shingle Roof Mounting is not only making the module installation easy and save time but also minimizing damage to the roof. Coming with PV mount flashing, there’s no need for trimming shingles, just drill one hole into rafter backfilling sealant and slide the PV flashing beneath shingle, drive the bolt home, and it is done. The tilt-in T module can be put into the extruded rail from the any location and can be highly pre-assembled with the clamp and L bracket to guarantee a fast and easy installation process. Equip with PV flash, there's no shingle cutting and no shingle distortion caused by trying to force a fit. Just a permanent, watertight mount every time!